There have been a couple of near stock 2012 Nissan GT-R's that ran in the 10's with a midpipe and other than stock tires. 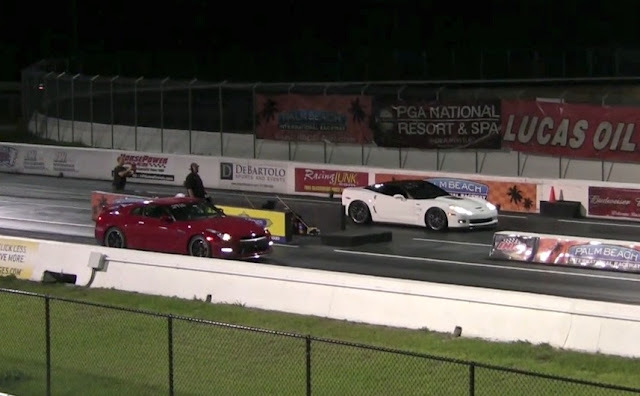 One 2013 Nissan GT-R owner took his car to PBIR, and laid down the first stock 10 second quarter mile pass. I believe this actually proves that red is faster, however there are some that disagree with my red theory. The quickest run of the night was a 10.87 @ 125.26 MPH with 0-60 MPH coming up in just 2.7 seconds and a 60-130 MPH time of 8.89 seconds (VBOX). Peak G forces on the launch were 1.3 G’s. The little extra power and torque of the 2013 Nissan GT-R along with the updated LC5 Launch Control system clearly shows when compared against the 2012 we tested last year which had a best time of 11.07 @ 124 MPH. A comparison of the 2012 Nissan GT-R split times vs the 2013 Nissan GT-R split times.